Camelia Liparoti's switch to the Yamaha YZX1000R SS side-by-side vehicle for the 2018 Dakar has helped raise the profile of the category. 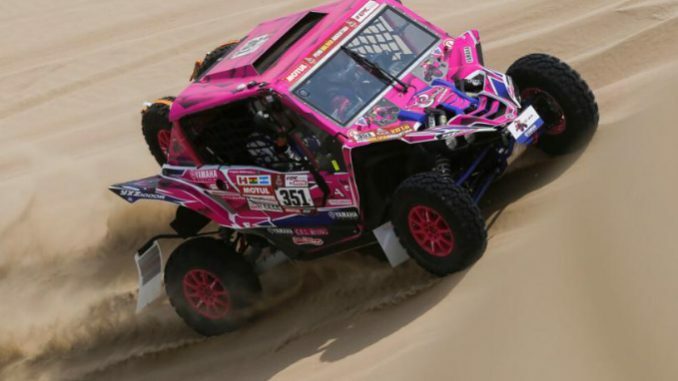 By swapping to the side-by-side vehicle category for the 2018 Dakar, Camelia Liparoti has helped to raise the profile of the fledgling category and the vehicles themselves. The pint sized Dakar veteran competed for nine consecutive years in the quad category, and is acknowledged as one of the most successful female off-road racers ever. She is immediately recognisable by her blonde pigtails and love for all things pink, and is known for her fun loving and quirky nature. But don’t let her girly looks fool you – she is a tenacious and talented racer. In those nine years on quads, she finished the event 8 times in a row. Staying loyal to the Yamaha brand that has given her so much success, Camelia raced a YXZ1000R SS in the 2018 Dakar and finished 5th in the category. The side-by-side vehicles, also referred to as UTVs (utility task vehicle), were given their own class in 2017. This year the category was officially renamed to Side-By-Side (SxS). Lighter, cheaper and in many ways more capable than cars, the category gives competitors a easier entry point into the toughest motorsport in the world. “It’s less tiring than riding a quad,” Camelia says. “And the sensations are great. When we speed over bumpy terrain, it feels like we’re flying because we have got good suspension”. Four times Dakar entrant Christophe Barriere-Varju (Dream Racer) agrees. He says the light SxS vehicles are easier to manage through the dunes and have less chance of getting stuck in the sand than the heavier cars. Stephen Gall, Jason Weller, Christophe Barriere-Varju, and Corry Weller at the Australian launch of the Yamaha YXZ1000 R SS SE. 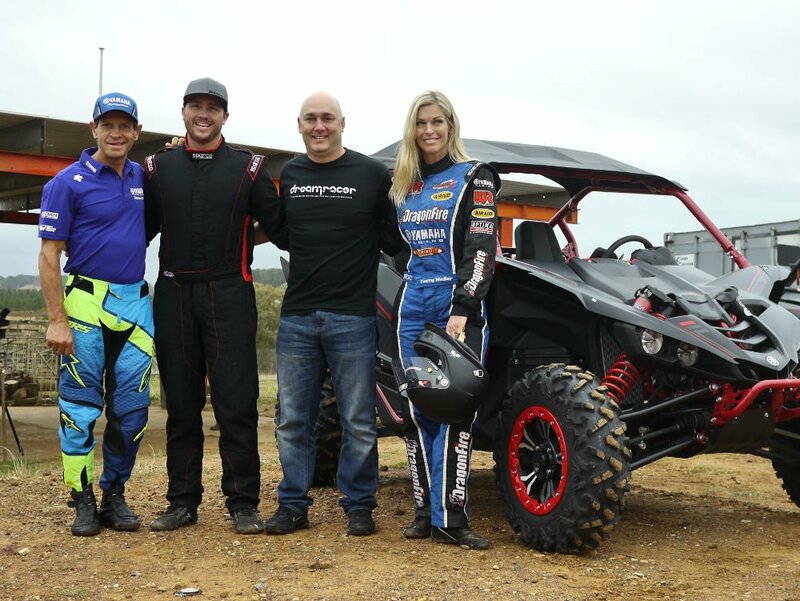 Christophe was at the Australian launch of the Yamaha YXZ1000R SS SE last year where he got to drive the vehicle, and be a passenger on demonstration runs with US off-road racer Corry Weller. His impression was that the YXZ1000R SS is very quick, nimble and capable of very sharp turns at speed but is also extremely capable over slower and far more technical sections of terrain. “It’s extremely easy to drive,” says 4 times Dakar competitor Christophe Barriere-Varju. And for someone wanting to get into off-road racing the YXZ1000R SS SE is affordable. Lance Turnley from Yamaha says that you can take one off the showroom floor, make it CAMS compliant and have a competitive vehicle for under AUD$40,000. But apart from it’s racing capabilities, the YXZ1000R SS SE is also a very competent option for farmers and recreational riders and drivers. independent double wishbone suspension front and rear with fully adjustable FOX 2.5 Podium X2 shocks. At the time of the launch, Lance Turnley highlighted that one of the key benefits of the Yamaha over its competition is the transmission. “It’s very unique in the marketplace because it’s the only one available with a sequential gearbox”, Lance said. While other vehicles are using a torque converter and CVT transmission, the Yamaha’s separate 5 speed gearbox gives the vehicle far more reliability and this is one of the reasons it is proving so popular with farmers and even government authorities. 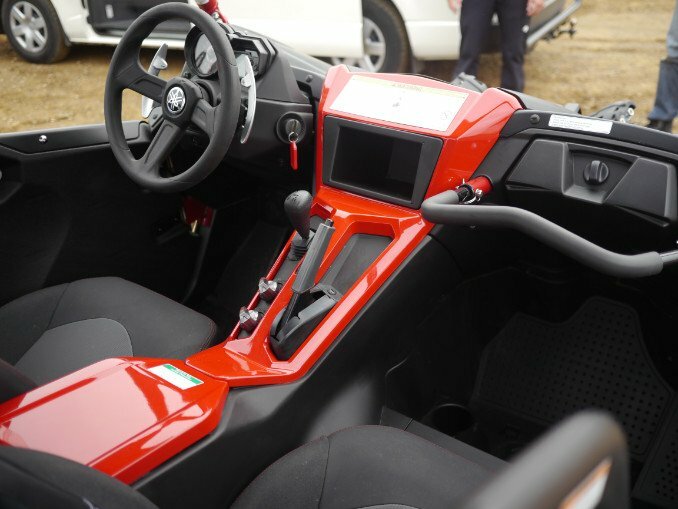 Another great benefit the electronics gives to drivers is that when you change gear the engine power is cut momentarily, just like a quick shifter on a motorcycle, so you can change gear with the paddles but you don’t have to take your foot off the accelerator. Lance refers to it as “guilt-free flat shifting”. Because the YXZ1000R SS SE is such a specialised vehicle, Yamaha Australia distributes it through selected “sport/rec” dealers who are trained in both sales and servicing of the vehicle. Lance Turnley says those dealers run demo days regularly to give prospective customers a chance to test drive the YXZ, as well as the Wolverine (another SxS vehicle in the range), and the YFZ450R and YFM700R “Raptor” sports ATVs. For more details about the vehicles or to contact a dealer within Australia, head to www.yamaha-motor.com.au.